I received this publication from Leisure Arts to review. I am not being compensated for this review. All opinion's expressed in this review are my own and are not influenced in anyway by the publisher. This post contains affiliate links. If you purchase this book through these links I make a small commission at no additional cost to you. 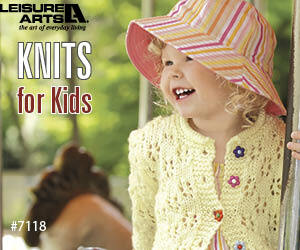 Leisure Arts Knits for Kids has 5 adorable patterns in it. Three for girls and two for boys. All of these patterns can be made in sizes ranging from 1 to 10. Each size is color coded. Size 1 is in blue, 2 in pink, 4 in green, etc. Each pattern is rated intermediate, has all of the materials and special stitches listed above each pattern and also includes a stitch guide and general instructions in the back of the book. Leisure Arts has also included all of the abbreviations used, the symbols and terms, and how to gauge swatch for each project. Each pattern has schematics with the sizing for each size in inches for you. Also included is a conversion chart for U.S. and U.K. needle sizing. All of the patterns are written in U.S. terminology. A chart for the various yarn weights and symbols are also included in the back of this booklet. The yarns used in these patterns are Caron Simply soft, Red Heart Super Saver, and Red Heart Classic. I cannot wait to be able to find the time to make one of these patterns for a grandchild. I will post a pattern review and some pics when I am able to complete one of these lovely sweaters from Knits for Kids.